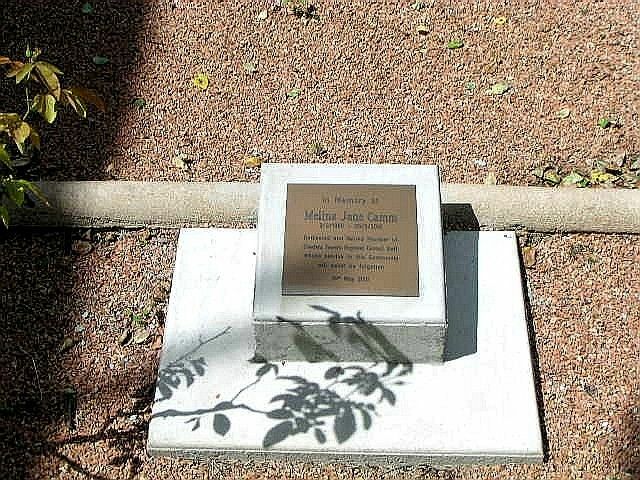 A plaque commemorates former Council employee Melina Camm who was tragically killed in a road accident in May 2010. Charters Towers woman Melina Jane Camm, 30, was on her way home from Townsville after taking her blue heeler, Blue, to the vet at James Cook University, when a driver trying to avoid a dead pig in the middle of the Flinders Highway ran into her lane and struck her car head on. She was rushed to The Townsville Hospital but died soon after.